2017. By Julie Boardman. 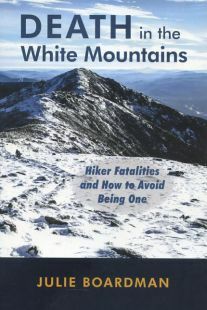 A new book that examines the many unfortunate deaths that have cliaimed the lives of more than 200 hikers, skiers and climbers in New Hampshire's White Mountains. The author looks at the root causes of these deaths and identifies the fatal mistakes frequently made by the mountain victims. Besides identifying the nine causes of death, the author offers advice to help keep your names off the fatalities list. Softcover. 192 pp.